Eggless almond-vanilla cookies- A melt in the mouth cookie, that is light and airy and golden brown in colour.Baked to perfection, its made from refined flour and ground almonds ,delicately flavoured with vanilla. 1. Cream together the softened butter and sugar till light and fluffy. 2. Add the vanilla essence and warmed milk. Mix thoroughly. 3. To the flour add the bicarbonate of soda and baking powder and sieve together. 4. Add the ground almonds to the sieved flour and mix together. 5. Gently fold in the flour and almond mixture to the creamed butter and sugar mixture. 6. Mix together to make a soft dough. 7. Wrap the dough in cling film and put in the fridge for 30 mins. 8. Heat the oven to 180 degrees centigrade. 9. After 30 minutes remove dough from fridge and divide into 4 parts. 10. 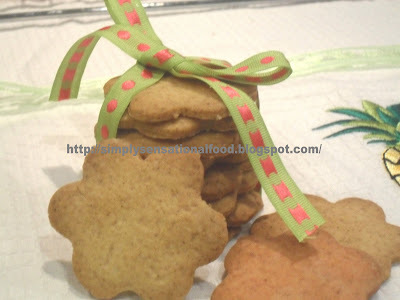 Roll out each part onto a floured surface and cut out desired shaped cookies. 11. Transfer the cookies to a greased baking tray and cook in the oven for 7-8 minutes till lightly brown. 12. Remove from oven and cool on a cooling rack. 13. Repeat for remainder of dough. Store cookies in an air tight jar or container. Cookie cutters and baking trays available from amazon, to purchase please click the link for amazon in side bar of this blog. 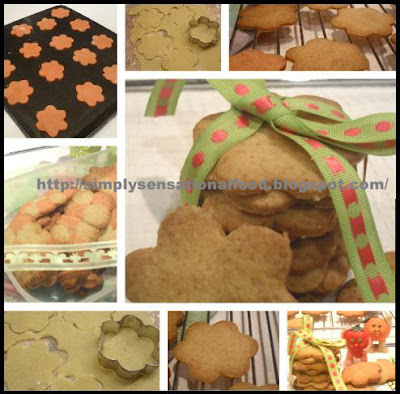 Beautiful cookies...love them..Perfect for the season :-)Happy New year !! These cookies look absolutely beautiful! I love your presentation and the simple recipe, thanks for sharing! Looks so delicious. Happy New Year to you and your family.Re your question on Hydrogen Peroxide, yes it is safe to use the 3% concentration. It is a very popular home remedy.